Fresh and full of flavour, this light seasonal supper is easy to make and ready in just 20 minutes. Cook the pasta in boiling water for 15 minutes. Add the peas for the last 2 minutes of cooking time. Meanwhile, heat a non-stick frying pan until very hot. Add the pancetta slices and cook for 2-3 minutes, turning once, until crisp. Remove the pancetta and place on kitchen paper, reserving a little of the fat in the pan. Add the garlic and lemon zest to the frying pan, then cook gently for 2-3 minutes until the garlic is softened but not browned. Drain the pasta and peas and return to their pan. Stir in the garlic and lemon zest, mint and lemon juice. Season with freshly ground black pepper. Roughly chop the pancetta slices and stir into the pasta. Serve immediately, topped with the cheese shavings and drizzled with balsamic glaze. Serve with a watercress salad. Try adding other seasonal beans such as broad beans or runner beans. 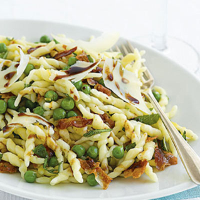 Try different shapes of pasta, too, such as wholewheat fusilli. Enjoy this wholesome pasta dish with the cherry fruit flavours of soft, supple Pinot Noir from New Zealand.